Connacht outhalf Jack Carty who was on song with his boot against Scarlets. Connacht's European qualifications face a huge test on Saturday when they travel to France for a crunch Challenge Cup fixture against Brive. Connacht lead pool one with 13 points, but Saturday's opponents Brive and Newcastle are just two points behind, ensuring the pool is very much up for grabs. Win, and Connacht are likely pool winners - with the game at home to Enisei the following weekend. Lose, and even a runners-up spot is doubtful. "Our main thing is to get out there and make sure we get the job done," says Connacht coach Pat Lam. "If we don't win this match, and you look across the pool, it's pretty close, then it's going to be hard to get through. I'm not saying it's impossible, but it's a simple equation, and we are pretty much in knock-on rugby now." Connacht overcame Brive at the Sportsground by 21-17 after a bruising encounter, and Connacht are preparing for more of the same, backed by a typically passionate home crowd. Brive currently sit seventh in the Top 14 - just six points behind leaders Racing 92, Toulouse and Clermont Auvernge - which is testament to the season they are enjoying. "Brive had a week off from the Top 14 and they are going really well. They are a massive team, probably the biggest we have played all year, but we are embracing the challenge. We know if we win, the outcome will get us closer to qualification, and there is a big question mark if we don't. "In the Sportsground we challenged them well, but we know we have to be on full petrol because it's going to be a bruising encounter. But the thing I love about these boys is they love these sorts of challenges, and we know, if we work together as a team, we have a great chance." Robbie Henshaw will be missing from the starting line-up after a recent scan revealed his hand had not healed sufficiently. "The CT scan showed it had not fully healed, so he has been advised to take one or two more weeks - he may be available next week, hopefully," says Lam. There is good news, however, for prop Denis Buckley who has been fully cleared by his surgeon. The Ireland squad member, who had suffered a high ankle sprain in Connacht's win over Munster, had resumed partial training last week. As a result Buckley has been re-registered for Europe in place of Academy prop Saba Meunargia. Also available this week is No 8 Eoin McKeon (elbow ), while Darragh Leader (hand ) has returned to training, but remains "touch and go". However three players - lock Andrew Browne, scrumhalf Kieran Marmion and centre Craig Ronaldson - have all been sidelined following Connacht's last-minute Pro 12 defeat to Scarlets. Marmion suffered a hip pointer, while Ronaldson took a shoulder knock. Although both will be monitored and fitness tested later in the week their availability is doubtful. Definitely ruled out is Andrew Browne who is expected to sidelined for up to six weeks after an MRI revealed an AC fracture. Lam says Browne is a big loss considering Quinn Roux and Ben Marshall remain on long term injuries, and Lam will now look to Aly Muldowney, and youngsters Ultan Dillane, and Danny Qualter, to fill that position. With European qualification on the line, Lam is expected to travel with a strong team. "We have come off a bruising game against Scarlets and with a short-turnaround. We leave Thursday because of an early Friday flight and we go to Lyon where we then have a four-hour drive, so we have to factor all that in and make sure we have the best 23 available out there." Lam will also be keen to arrest the recent run of defeats. 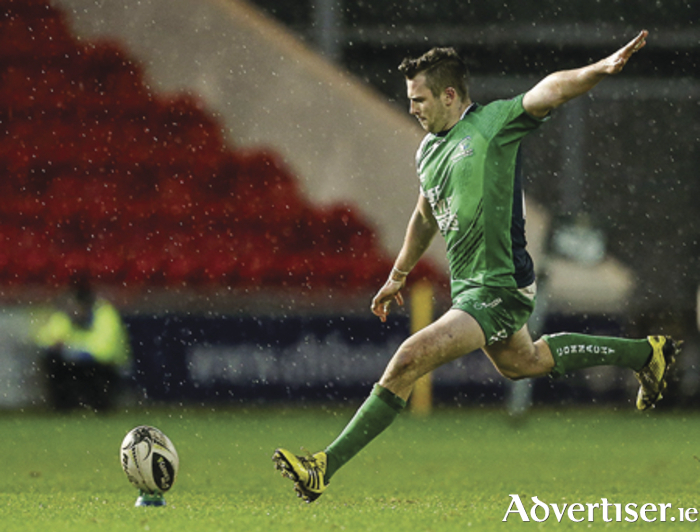 Last weekend's 21-19 loss to Scarlets saw Connacht slip to fourth in the Pro 12. However Lam says he is happy where they sit, if not satisfied. "If you look at our games, we could easily have been undefeated. All those games we were right in there - the bounce of a ball, a decision here or there, and things completely change. But with that in mind ,we know we are not far off, and that could easily change. We are still in that top four, we haven't' dropped out of it. The one thing we do is play everyone again - except Cardiff - which is exciting and that will determine if we make it or not." Lam, however, is concerned with the drop in discipline levels in the last few games. "One of the things we have taken a lot of pride in over the last couple of years is our discipline, the Fair Play award, and our discipline record has been really good. Unfortunately our discipline, for some reason, has slipped. We have had a couple of yellow [cards], so it's an area we do focus on. "It's a mixture of guys pushing the boundaries and opening ourselves to interpretation. The main thing is that guys are self aware, can improve, and move on. We have to live with decisions that we get, everyone is human." The defeat saw Scarlets return to the top of the Pro 12 table, while Connacht picked up a losing bonus point. Two TMO decisions went against Connacht when referee Marius Mitrea went upstairs to TMO Paul Adams, and on both occasions the Welshmen ruled against Connacht. And, having dominated both possession and territorial stakes, Connacht's indiscipline resulted in two yellow cards - the first of which was issued after nine minutes to centre Bundee Aki for a shoulder charge on Scarlets' influential centre Regan King. King was once again the architect of the home side's best attacks, but Connacht, propelled by some superb touch kicking from outhalf Jack Carty, not only weathered that early pressure, but took control. Quick-thinking No 8 Eoghan Masterson appeared to have beaten prop Evans to score the opener, but somehow the try was not given, letting Scarlets off the hook. However when King also saw yellow on 23 minutes, Craig Ronaldson opening the scoring, and strong defensive pressure forced a turnover which resulted in left wing Matt Healy running the length of the pitch to score in the 26th minute. Ronaldson adding the extras, and although Scarlets' outhalf Aled Thomas replied with a penalty, Connacht looked to have crossed the line again when Tiernan O'Halloran provided the attacking impetus for Healy to cross - his try denied for having lost the ball forward. The Scarlets, let off the hook, opened the second half with intent, and were rewarded with a Thomas penalty. However it was a poor Connacht clearance that gave their opponents the opening they needed, and right wing Steff Evans burst through to give his side a 13- 10 lead. Connacht levelled with a Carty penalty, and thereafter Pat Lam's men looked to have the edge, playing a strong territorial game. However a superior Scarlets scrum provided the home side with the platform, and King's superb spacial appreciation sent fullback Michael Collins through for an 18-16 lead. When Connacht regained the lead with a Carty penalty, it looked sufficient to end their three-game losing run, but, in the final act, Adams recommended a yellow-card for replacement lock Ronan Loughney for lifting a player illegally when trying to clear a ruck. The resulting penalty was converted by replacement outhalf Steve Shingler in the 79th minute, denying Connacht an important eighth Pro 12 victory.